Just my opinion: Tickets are starting to get WAY too busy with information, buttons, links, drop-downs and options thrown all over the place. I know RS is a work in progress, but it's obvious that things have been added in that were never thought of initially. I'd like to see the Tickets module re-worked with some sort of grouping and organization that is more cohesive. Right now, there are buttons at the top that do some things, other buttons in the title bar of information boxes , and more added at the bottom of information boxes. 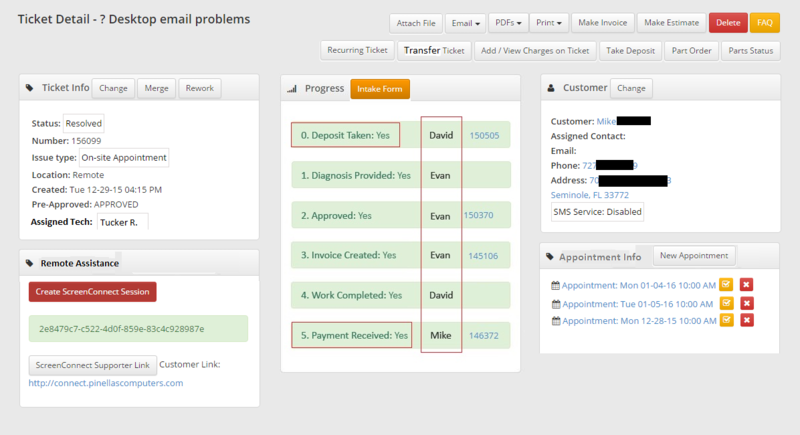 There's links for Appointments, mixed in with buttons for Parts Orders, Email buttons mixed with the customer info, Recurring Tickets button next to Appointments. Silliest of all, there's separate buttons for PDF and Print for the Intake Form, rather than adding those to the existing PDF and Print drop-downs at the top. God forbit you have an Appointment or session with ScreenConnect or TeamViewer, and you're pretty much looking at 100 things you can click. I really think this is overdue for a cleanup. Thanks RS! Move "Transfer this ticket" to Actions drop down menu? Progress bar update has lots of votes. We can have now? If you guys have ever seen the Xero accounting application being used, it has an INCREDIBLE customer details page. If you haven't checked it out, please do so, or I can send a screenshot. It's just really well done and visually calls attention to the data you need most. 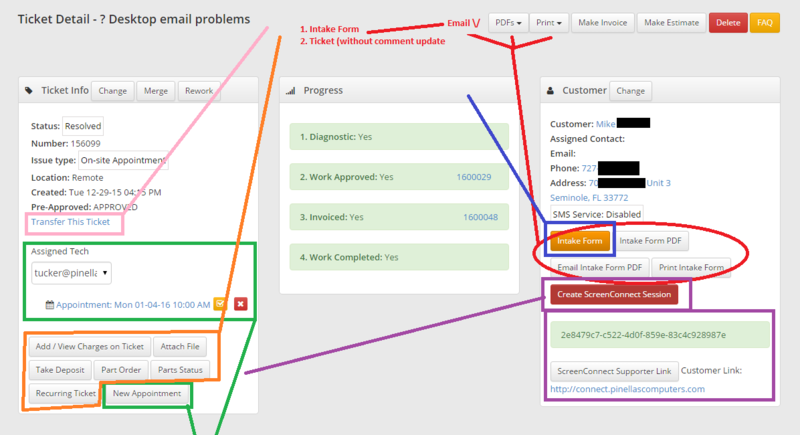 I'll send a contact through the feedback widget, sorry haven't checked the forums until today. James -- Contact us if you'd like to be a beta tester as a non-computer repair business. Ryan -- Really appreciate your feedback as always. :) We'll look at incorporating much of this. Though for now "Make Invoice" will be a primary (green) call-to-action as it's the standard flow for 90% of our users based on our data. Definitely realize there are many workflows supported and used across our user base though. Also, the Progress Bar is a different scope of work from this and something we'll be looking at separately. A. Print and PDF drop downs are PERFECT! B. Actions drop down is a GREAT space saving idea! C. I like Remote assistance on the side you chose MORE than my original idea! 1. Make sure intake form "alert" button (if none signed) still shows up "in your face" so we know one hasn't been signed. Maybe in place of where "Make Invoice" is? 4. Highlight key drop down options with colors, if applicable (like Delete being red). I'm happy with RS again! Second: Can you guys please make sure you beta with some people outside the computer repair industry? It might help to gain a different perspective. We're pretty excited about this on our end as the UI is probably one of the hardest things to work with. I agree, it needs a major clean up. It is so hard to follow and find things and not very intuitive. Lots of votes for this. Can you at least change some of the simple buttons and formatting everyone is looking for? Please. Thanks Chuck. My ideas are the greatest! I agree with you so much. You couldn't be more right. I agree with this post and very much appreciate the sample of the re-worked layout. I have been training my techs for the past 2 weeks on RS and it has been a bit disorienting on where to go to on pages for specific tasks. I like the grouping and simplification. To add a bit to this, I would also like to be able to see a section higher up on the ticket with the "Complete Issue Description" and not just the "Ticket Title" - which isn't very descriptive. Right now we have to wade though a lot of comments, as our shop tech's like to make very detailed notes, to the bottom of the ticket to make sure we have completed all items requested by the customer at check-in. Thanks much RS. I have been loving the updates. Keep them coming!